The Officinalis 333 Ginseng is a mix of 3 types of ginseng that helps when your horse is tired after strenuous exercises. The supplement supports a quick recovery after training or competition. The Officinalis 333 Ginseng is an animal food supplement that can be used in cases of tiredness. The supplement contains 3 types of ginseng and other components that contribute to your horse's energy level. The supplement supports a quick recovery after training or competition. Sexual exhaustion in breeding stallions. One syringe daily for horses weighing 500kg. Water, dextrose, dry herbal extract (Brazilian ginseng root, damiana, rose roots, Siberian ginseng, Korean ginseng). 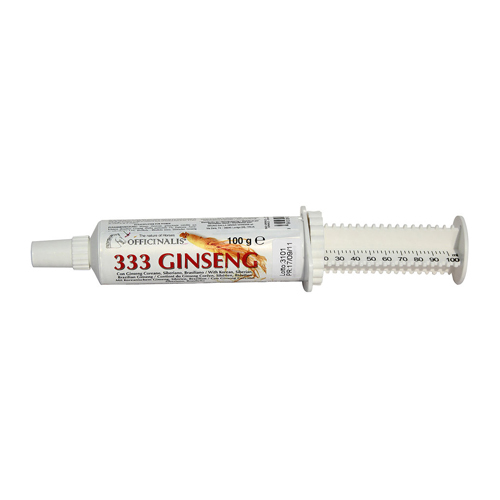 Have you used Officinalis 333 Ginseng before? Let us know what you think about this product.